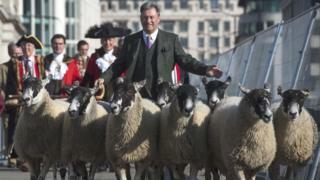 Alan Titchmarsh drove a flock of sheep across London Bridge as part of a centuries-old tradition. The TV gardener was joined by more than 600 Freemen of the City of London as they exercised their "right" to herd the animals into the ancient heart of the capital. Freemen were historically allowed to bring livestock and tools into the City without paying tax. The stunt is expected to raise tens of thousands of pounds for charity. A flock of 30 sheep from Bedfordshire were brought into central London for the day, which also aimed to raise awareness of agricultural issues. The TV presenter said: "This reminds them of the importance of farming and all it produces." He added: "I don't think I've done anything odder than this on a Sunday morning. This takes the biscuit." The gardening expert took part in the ceremony, following in the footsteps of the likes of Dame Barbara Windsor who herded the animals across the bridge in 2015. People can become a Freeman by paying a fee or as a reward for public service. Tens of thousands of pounds are expected to be raised for the Lord Mayor's Appeal charity. Charles Bowman, Lord Mayor of the City of London, said: "It is wonderful to be able to take part in this event to raise money for such fantastic causes."